You Meant to Ask for Her Number But Didn’t…Now What? July 11, 2013 By Beth | Heads up: Buying via our links may result in us getting a commission. Here's why. Ask A Woman: The Hunt for Red Hot Date. I volunteer on Saturdays tutoring middle school kids and there’s a fellow tutor that I’ve meant to ask out. She’s seems kind and funny. She’s extremely driven to do some crazy things I’d never attempt professionally, which I frankly admire. Yes, she’s cute as a button, too. Our program runs over the school year and the last session was this past week – she wasn’t there. Of course, I’d meant to ask her out the week prior but I waited till this last week to ask her for her number – I’ve had ample opportunity as we’ve been coming down together on the train after the program. Here’s where we are – the only way I can reach out to her is to ask the person who coordinates the program to pass her number to me or pass my number along to her. I wouldn’t want to put the person coordinating the program in an awkward position having to maybe pass on some private information that they don’t feel comfortable sharing so I’m thinking I just ask to have my number passed along. In fact, I think she’ll say yes (and I’m not the most optimistic person when it comes to these things) – I’m just not sure how to get to asking the question now. What do you think is the right way to go here? Sometimes dudes write in about a dating issue and all they really need is someone to tell them they’re already doing the right thing. This would be you. You’re so close! You’re on the right track! Look at all these reasonable, upstanding men reading Dappered who have really thought through their decisions when it comes to pursuing women–you readers make me feel optimistic for all the single gals out there. Truly. It’s an honor to hear from all of you. I feel where you’re coming from with the, “Damn, should’ve asked her for that number when I had the chance.” We’ve all been there–have you ever looked at the “Missed Connections” part of Craigslist? People regretting their inaction all over the place. But your idea to contact the program coordinator is a solid one. AND, your instinct that this person might feel uncomfortable releasing another volunteer’s phone number is also right on. So I’m just here to reassure you–yes, call or email the program coordinator and say, hey, thanks for your support this past school year, it was a great experience. Also…I was hoping to connect with so-and-so over the summer but I don’t have her phone number or email address, and she doesn’t have mine. Would you mind passing on my phone number to her or asking if she minds your giving me her phone number? Hopefully the program coordinator is a sympathetic person who will do a little extra leg work to help you out. If she doesn’t, consider other avenues to getting in touch with your lady–Facebook if you know her last name, other volunteers from the program who might know her, riding the same train you took with her day and night to see if she shows up on it (kidding about that last one). Once you get the contact information of this woman, keep it casual and upfront. “I had such a great time hanging out with you this school year, would you like to get a drink/meet for lunch/go for coffee/take a walk this weekend?” If she says yes, awesome–you’re on your way to having a summer romance. 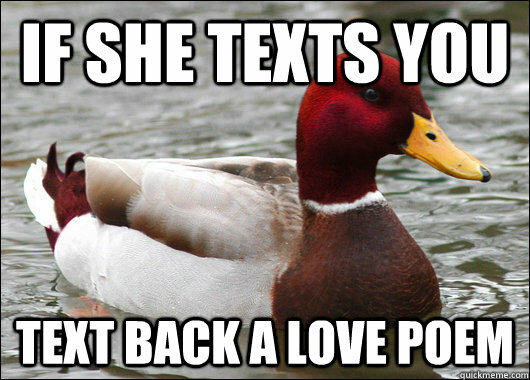 And if on the off chance you misread her and she’s not interested, don’t take it too hard. “Okay, well, it was good chatting and maybe I’ll see you next school year.” Be light and get off the phone as soon as possible. The hardest part about dating, initially, is always this–putting yourself out there. I sound like a broken record, I know, but you just have to do it. Take a chance, be willing to be vulnerable, be willing to experience pain and disappointment (because this comes hand-in-hand with joy and satisfaction). Life’s richness is borne of equal parts success and rejection. Good luck TK. Anyone else out there embarking on a summer romance? Ouch. Sounds exciting’! Good luck! Was this letter post dated in 1985? Just hit Facebook, Instagram, twitter, linkedin, etc. She’s bound to be on one of them. Ehhh. I kinda like the legwork he’s willing to go to in order to contact her personally (you know.. one of those 1985 forms of communication.. fingers crossed it’s a fax!). I think it’s a nice move, personally. I think going for the personal contact is the more bold move, and there’s no real risk that she’ll think it’s creepy. But because it sounds like she has shown some reciprocal interest, the electronic approach probably wouldn’t be a mistake, either. I think chances are she’d prefer the effort taken to contact her personally. Facebook etc. is a good second option, but his current strategy comes across as more confident in my mind. Just look her up on Facebook instead of coming off as a coward that can’t ask her for her number yourself. TK, you’ve worked with this woman for a year and you weren’t able to work up the courage to ask her out. Your current situation is a result of your lack of courage. In the future, have confidence in yourself and ask her out as soon as you’re interested. While that may be true in part, there are likely other factors involved. For example, I’m personally not a fan of dating anyone I work with–similar feelings could be part of the reason he waited until the end of program (i.e., when they no longer ‘work’ together) to ask her out. hornsup84, That’s a good point. I’m 100% with Bruschetta. One lesson that I’ve learned the hard way is: You don’t wait for the opportunity to present itself, you make the opportunity happen and have a backup plan. That is “being” bold/courageous as opposed to just “sounding” bold. If you really want something, evaluate the risks. Even following the axiom of “don’t crap where you eat” (aka don’t date someone at work), the second to last week would have been a perfectly good time to act, with the actual last week as a backup. And as a disclosure I married someone I worked with so I have a peek into the difficulties with this situation. To be completely honest, what would be good for TK is that the program coordinator gives the contact information. What would be _great_ however, is if the program coordinator doesn’t have/give the contact information and TK learns a lifelong lesson to be proactive in life. I agree that the 2nd to last week was his mistake in not asking / being timid. However I’d also venture that it’s easier to make the call from the bench (married) than if you’re standing in the batter’s box, too… Sounds like the guy actually likes the girl, and that does funny things to some guys on occasion. All that to say, sounds like he knows he made a mistake and he’s trying to figure out the best way to remedy it and not lose the chance entirely with this one. Hope it works out for the guy, and if not that he learns to take advantage of opportunities when they arise (if they seem right at the time). The rule about not shitting where you eat is an important one. I don’t know how much that played into it, but there’s more to this situation than just him asking the girl out. To call marriage being on the bench is naive. To use sports metaphors, you become married after playing in the regular season. Marriage is the World Series except the number of games to play is infinite. Hence a high divorce rate in modern times. It takes World Series caliber play everyday to make a marriage work. I don’t disagree with your analogy, but it is talking about a different “game” than I am — I’m talking about approaching/meeting/first-dating new girls, not having a lasting relationship with one girl. Hopefully your marriage isn’t filled with doing that on a regular basis 😉 Then again, I don’t know since I’m not married — maybe that’s why so many people get divorced hah. To be completely honest, I don’t disagree with your advice or your viewpoint. I AGREE with you: We don’t know TK’s factors in life, but being proactive is a good thing to keep in mind for all walks in life. Loving your wife/husband/partner and keeping him/her in love with you is everything in the dating game + 2000% more responsibility and pressure –> infinity. Very simple idea. But not easy. And to keep using sports metaphors, I don’t know why people don’t get coaches. All the best teams and players have coaches, but in the marriage game, people only seem to seek a coach when it’s the 9th inning of a 200 game losing streak and there are no more fans in the stands. But then ask her out as soon as you’re done working together! Been there, done that. It tends to work. But again, I think he’s on the right track here. Don’t wimp out and go through someone else. Contact her yourself. Man up. If she likes you, she’ll give it. If not, then move on. The high divorce rate is a misconstrued piece of data. The divorce rate indicates total number of failed marriages, often being skewed by serial monogamists. Do you know anybody that has been married and divorced three or more times? Those people are skewing the data. I agree that statistically a small number of active subjects can skew the outcomes. Divorce unfortunately also has cultural social bias that would influence the data today vs say 50 years ago. A statistic can be skewed but still be truthfully high. 30% is still high according to other analyses performed on the data. As a disclaimer, I am in a field that deals with epidemiological and clinical data analysis. Also, 50% of my friends in their mid thirties are first time divorcees. Small n but still an interesting personal observation. I agree that the social bias has a lot to do with it. Attitude is very important when it comes to marriage. If you aren’t committed to it one hundred percent, your likelihood of divorce increases; that’s the nature of commitment. If people don’t want to get married, they shouldn’t, but the divorce rate is a strawman argument that doesn’t address the real issue. Admittedly, I’m not married. I hope to be some day. And I hope that I will truly love the person I’m hypothetically marrying. I’m a romantic, but I think we put too much cultural stock in romance. As my father said, “I’ll be a widow, but I won’t be divorced.” Once married, love is the gravy, not the meat. The gravy might dry up, but I don’t believe that a marriage suddenly becomes invalidated because the involved parties are no longer in love. A year is too much time. I fear you’ve been friendzone’d. Equal parts success and rejection? At my age I’m not sure I can handle the 1,750 successes that are coming my way. I believe my father to be most wise. He said, “When in doubt, ask her out”. When in doubt, ask her out.